The Expo Camera Company of 256 W. 23rd St., New York, produced cameras in the 1900s. 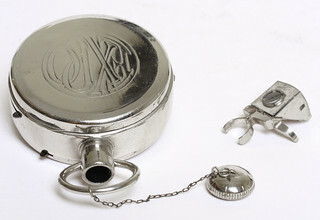 Expo Watch Camera (1905-1939): as the name suggests, a camera the size and shape of a pocket-watch. It takes twenty-five exposures ⅝ x ⅞ inch (16 x 22 mm) on a daylight-loading film cartridge. Police Camera (1911-20): a small, metal-bodied box camera with a fixed-focus achromatic lens and with a focal-plane shutter, but with only 'T' and 'I' speeds. Intended for discreet or covert use. Expo Focal Plane Camera (about 1911): very similar to the Police Camera. This model has a Watson viewfinder, which rotates for horizontal or vertical use. Expo Easy-Load (1926): a box camera for 4 x 6.5 cm exposures on film in special 'Easy-Load' film cartridges. 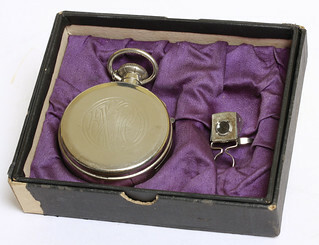 ↑ Expo Watch Camera at Scott's Photographica Collection. ↑ US Patent 769319 Photographic Camera, filed October 1903 and granted September 1904 to Magnus Niéll and Thomas Wallace, describing the Watch Camera, at Espacenet, the patent search facility of the European Patent Office. ↑ Expo Focal Plane Cameera sold at the 23rd Westlicht Photographica Auction, on 25 May 2013. ↑ The size is 4.5 x 6 cm according to the listing in McKeown; the caption to Ull màgic's photo gives the picture size as 4.7 x 7.8 cm, which would better justify special cartridges (4 x 6.5 is the standard full-frame size for 127 film). This page was last edited on 17 November 2013, at 23:18.